Classic difficulty may turn off younger gamers. 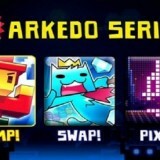 The Arkedo Series is a game after retro fans heart. For a relatively small price tag, you get three separate pieces of retro goodness with loads of replay value (when we were kids, we beat the same game fifty times…..and we liked it!). The great pixelated graphics manage to make 8 bit retro look vibrant and clear, and the simple yet challenging gameplay promises a great time to anyone willing to accept the challenge. Sanuk Games brings a trilogy of retro goodness to Playstation Network. Remember those games you loved as a kid? The platformer that you had to play over and over again, just to finally get past another level and then die yet again? Everything had to be timed just right or you wouldn’t make it……but we loved it, and played it over and over again. Remember the great puzzle games we used to have? They weren’t anything fancy to look at, just a colorful playing field and an absolutely addicting puzzle mechanic. I remember powering up the Nintendo as soon as I got home from school, trying always for that ever elusive high score. And even when I reached it, it just meant there was another score to beat. 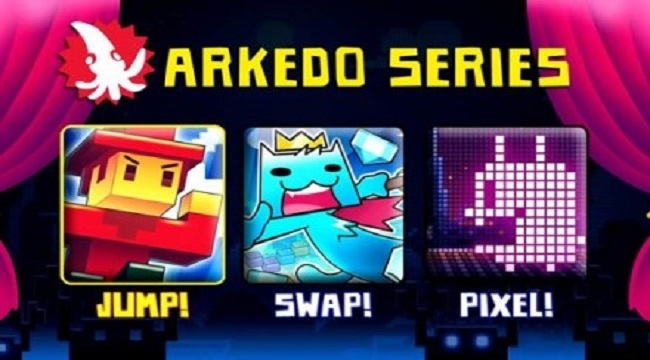 The Arkedo Series from Sanuk Games brings back those great classic games in a single bundle that will leave retro fans grinning from ear to ear. The Arkedo Series is a bundle, which means there are three separate games (accessible from the main menu) for you to choose from. JUMP! 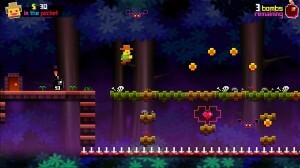 is your average retro platformer. 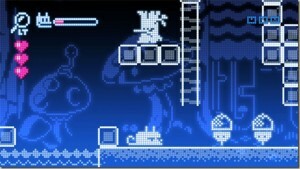 There aren’t a ton of levels, but the ones that are there will keep you hopping (see what I did there?). Basically, you need to jump your little guy from platform to platform, without dying. 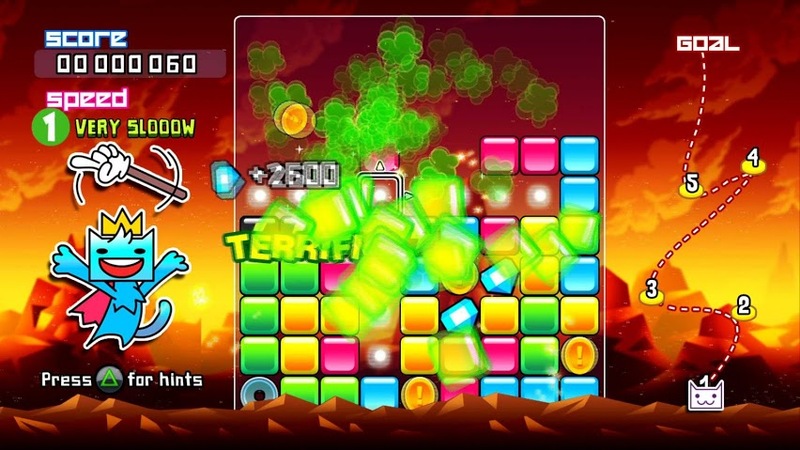 There are bombs scattered around each level, each of which must be collected before its timer counts down. If a bomb explodes before you reach it, you die. If you collect them all in time, you need to make your way to the door that has now opened (again without dying) in order to reach the next level. It gets more and more difficult as you advance in levels, but the basic premise stays the same. Another thing you’ll remember from your childhood is finite lives. Most games nowadays have some sort of infinite lives – you can die as many times as you need to advance past the levels, and I am definitely a fan of that in most cases. However, for the Arkedo Series, the idea of having to collect extra lives at peril, and praying you make it through a level on your last one, all only serve to enhance the retro theme. If you’re going to make a game retro, you can’t do it halfway. You’ll find no handholding in any of the three games in Arkedo Series. If you die, you get sent right back to the beginning, old school style. SWAP!, I must admit, is my favorite of the three. From Tetris to Tecmo Stackers to Bejeweled, I looove puzzle games. There are a lot of bad puzzle games out there though, and the one thing that a game must have to succeed is an addicting and at least somewhat original mechanic. SWAP! fits both bills perfectly. 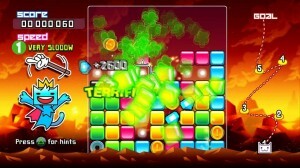 The basic idea of the game is what I think of as kind of a cross between Bejeweled and Tetris. You have a field of colored squares that start at the bottom and stack their way to the top, from the bottom up. Of course, if they reach the top you’ll die – so you need to eliminate them quick. To do this, you must create a line of four in row. You can swap two adjoining tiles by selecting it with the left stick, and then moving in the direction (up, down, left, right) you want to swap with the right stick. The controls took a few minutes to get used to, but after I got the hang of it they were perfect. As you advance in level, different items like jewels, lightning, and even treasure chests make their way into the mix, but the furious swapping remains your goal. There is even a little story line thrown in, of a lost king who must find his way home to his castle. Purely unnecessary for a puzzle game, but a nice touch nonetheless. And finally we have PIXEL!, the last of the three games in Arkedo Series. Pixel hearkens back to the days of Atari for me, with a heavily pixelated and mostly monochromatic design. 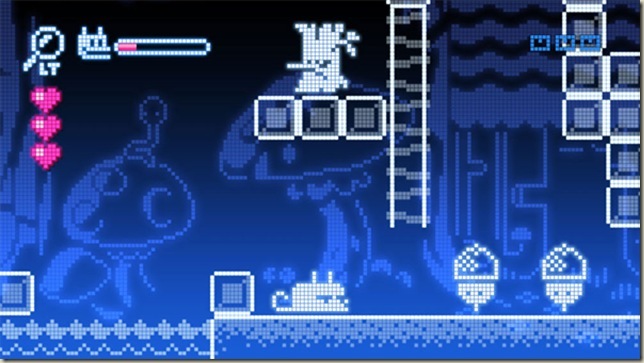 In the second platformer included in the bundle, you’ll play as a kitty who has to (again) make his way to the door at the end of the level. This one differs quite a bit from JUMP! though. PIXEL! 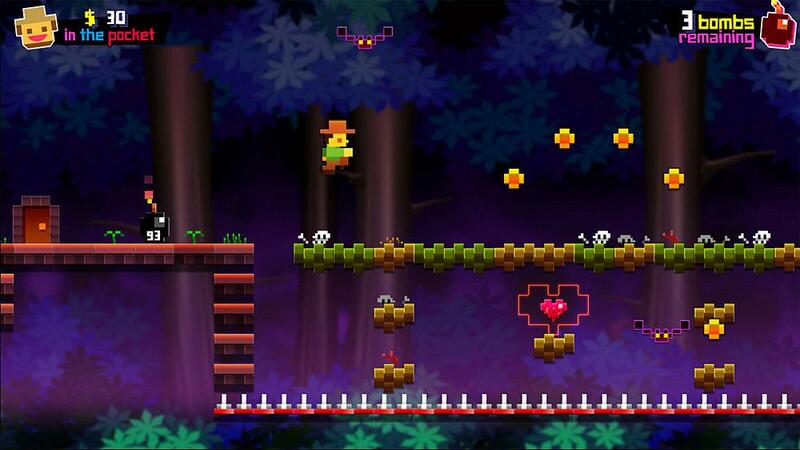 has enemies for you to fight – Mario style – by jumping on their heads. If you jump on five enemies, you’ll fill up your special attack (we like to call it the “Power Meow” around here), which lets you mew out a single line of fury to hit an enemies directly in front of you. In PIXEL!, items like treasure chests and the final door are hidden. To access hidden parts, you need to use your magnifying glass, which accesses a maze type mini game. You need to quickly work your way through the maze before time runs out, otherwise you’ll get kicked out of the maze and by injured. It’s a fun enough little game, with a good grasp of the “play over and over again till you get the timing just right” mechanic that old school games did so well. I did prefer JUMP! personally, but PIXEL! offers longer levels and an entirely different look.